At the time of survey the instruments were turned on and the Autohelm ST50 Wind showed readings which were assumed OK. Wrong! Ideally should have been checked against another instrument with known accuracy. On the delivery voyage the instrument was giving readings inconsistent with prevailing conditions. Later in Dartmouth a close inspection of the vane revealed some damage to the fin. At layup in November 2005 the masthead unit was removed and sent off to Raymarine for repair. Although they sent back a standard "10 year letter" to the effect that parts were becoming scarce their service was excellent. Turned out that the rubber vane was torn and perished and the bearing was seized. Repaired unit was back 10 days later at a cost of around £45. Not a major blow. En route to Recife in March 2008 it failed again. This time I simply removed the unit, cleaned it and put it back. It worked just fine. The Aries windvane servo blade had developed a habit of flipping up at sea. It didn’t seam to be seating home properly. I consulted Peter at Aries who suggested I check the seating washer. Water had got under the washer and some corrosion had developed. This pushed the washer out slightly preventing the blade from seating fully. I removed the washer cleaned everything and epoxied the washer back in place. Thereafter the blade seated perfectly. Raised washer preventing servo blade from seating home fullly. Rivets holding the uphaul/downhaul bracket failed. The pole was only 18 months old and had been lightly used. We rolled heavily on passage to Fortaleza. The gas pipe was not up to the job and the gimbal lock fell apart. The central underfloor flexible tank, new May 2006) developed a leak in the seam at one corner. During a safety gear check we discovered that an 18 month old Italian made lifebuoy light had failed due to extensive interior corrosion. Outrageous! It is supposed to be for marine use and the bit that failed, the mercury switch, had never been exposed to seawater. The failure was caused by condensation but coating the interior bits with vaseline would have prevented it. A replacement Lalizas light was purchased but but not installed until after we had left Puerto Sherry. It failed when the batteries were inserted. Six weeks later a more expensive Jotul Light was purchased. This did the job and has operated flawlessly. Tonto Marine undertook a routine Yanmar service. Nothing untoward was discovered and the engine was found to be in good order and ran just fine. It was confirmed that the propellor shaft had moved aft by about 1.5" inches. 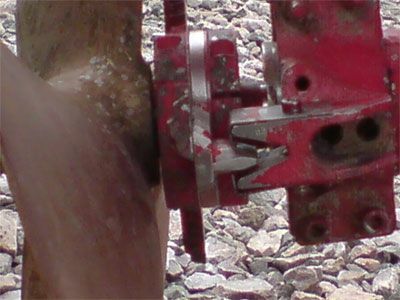 The cause of this movement was not immediately apparent but when the coupling was dismantled it was found that the locking pin had not been properly installed and was ineffective. Tonto refitted the coupling and added a locking screw so I do not expect a recurrence. Just to make sure I fitted a jubilee clip on the shaft just forward of the stern seal. The clips we had found loose and removed from the stripper in Denmark were refitted. 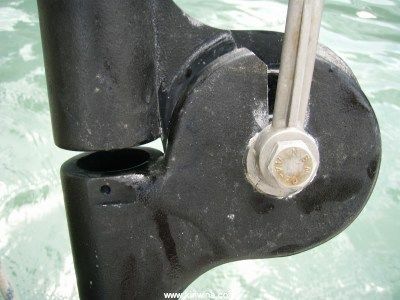 These clips had loosened after repeated contact with the locator plate as the shaft moved aft which also explained the noises emanating from the stern. On passage from Brighton to Cowes the radar failed in fog. This was only the second time it had been used in anger. Later inspection showed the cause of scanner failure to be water inside the scanner dome submerging the circuit board with the drain tube not being effective. The choice one was presented with was to try to find a replacement scanner for an obselete piece of kit (9.5 years) or uprgrade. I still don't think expensive electronics should fail after only 9.5 years. I don't mind the technology dating but early failure is not acceptable particularly after very very light usage. Small boat radar has progressed rapidly since 1997 and I looked on this more as an upgrade than a repair/replacement. The Autohelm radar replacement was a Raymarine C70 Plotter, Navionics Gold charts, scanner and a new GPS unit. A quantum leap in functionality. On passage to Dover the alternator warning light started to flicker and then stayed on. I stopped the engine and had a look. The wiring connections to the alternator looked a bit tired and frayed. I jiggled them about a bit and tightened the nuts after which the light stayed off when the engine was running. Once in Dover the connections were re-done and all seems OK.
Another case of very small subtle signs indicating a much larger problem. 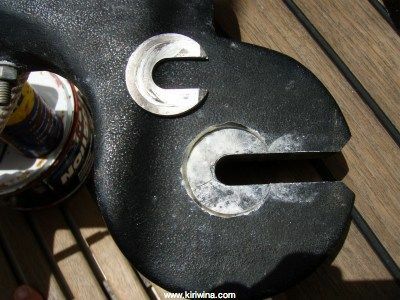 "Kiriwina" came with 3 identical 110amp batteries which appeared virtually brand new and caused no problems in use. 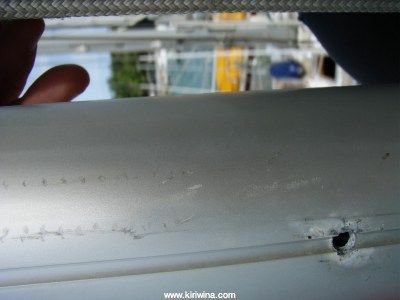 At inspection and survey some stains were noted on the aft cabin sole but the sole being securely screwed down was not lifted. At delivey when filling the fresh water tanks I noticed there was sulphuric acid on the tanktop. The broker was present and of course had no idea how it got there. I flushed the tanktop and bilge liberally with fresh water. Back in Dartmouth I bought some bicarbonate of soda and dosed what I thought was the affected area. It was only during winter that the full extent of what had happened became clear. Leafing through some Northshore maintenance invoices there was quite a large one for electrical work. I had been told that the batteries had been replaced because of damage caused by incorrect terminal wiring. I suspect that this incident caused a large acid spill which was not properly cleared up. 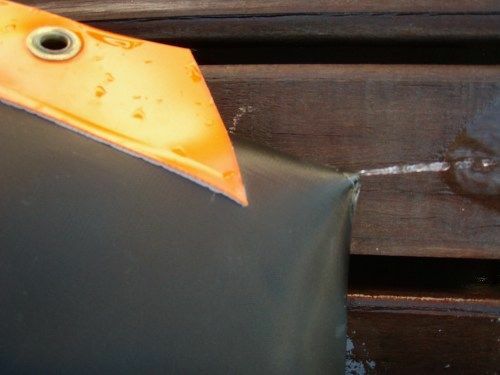 Acid damage included destroyed strumbox on auto bilge pump, badly damaged eberspacher ducting in way of the spill, battery box woodwork and underside of cabin sole. All were replaced/repaired at substantial cost including a new cabin sole. The Yanmar 2GM was checked over in the yard prior to delivery in August 2005 by the local Yanmar dealer. All appeared OK. Due to a lack of wind we had to motor all the way and the engine performed faultlessly. On the next visit the engine was checked over. The coolant was quite low and the alternator belt had become quite loose. The belt was tightened but the reason why coolant level had dropped so far was not immediately apparent. 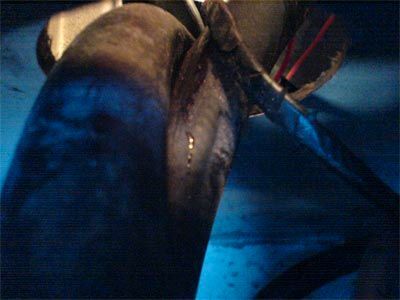 After topping up the coolant gradually disappeared each time the engine was run but there were no apparent leaks from the engine and no coolant in the bilge. The problem was temporarily dealt with by regularly topping up the coolant reservoir. Finally, at lay-up while winterising the engine, the cause of the loss was found. 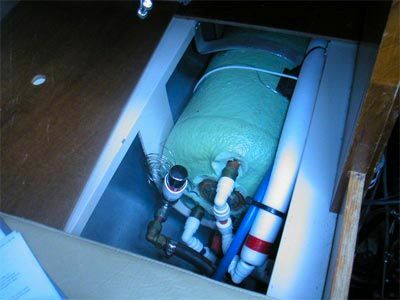 Two coolant hoses pass through the starboard engine room bulkhead to the domestic hot water calorifier. A circular hole had been cut to facilitate this access but the edges had not been smoothed and were very sharp. The builders had protected the hoses with PVC wrap but this proved insufficient against the sharp GRP edges on the bulkhead hole. 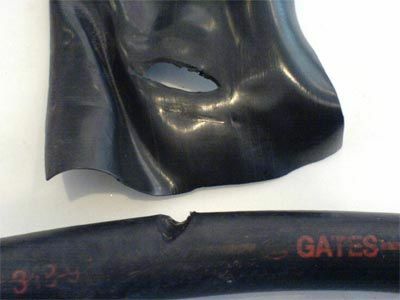 Over 500 hours of engine use the PVC wrap and then one hose had rubbed against the sharp GRP and been sawn through. This resulted in a V cut into one hose causing an initially tiny but gradually increasing coolant leak. 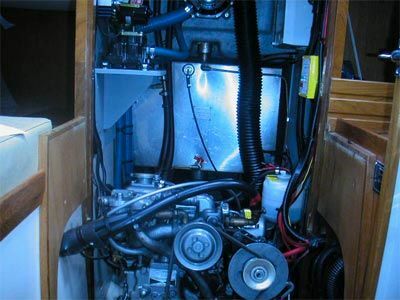 Coolant leaked from the hose into a starboard lower locker and flowed forward under the fridge box before accumulating in the starboard lower locker under the chart table. At initial inspection and again at survey a sticky residue had been noted in this locker but we had been unable to identify the source. All was now clear. The residue remained after small volumes of leaked coolant had evaporated. At layup several litres of coolant remained in the locker. 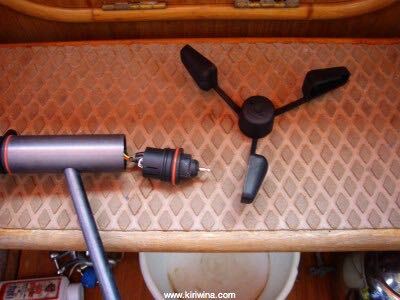 A very annoying problem resulting from questionable hose run protection which would have emerged much earlier on a more regularly used boat and likely been covered under warranty. Stlll a satisfying outcome which required only a £10 length of hose and adequately robust run protection to put right. Calorifier Bay. Black hose at the bottom is the culprit. Hose wrap and hose after contact with rough sawn GRP. Original calorifier hose run at lower left. Closeup of calorifier hose run. Note raw sawn hole in GRP bulkhead. Nothing to do with Kiriwina but a related gear rant. Why is it that tender bags are so useless given what is to be carried in them? My Suzumar tender bag tore at the handle the second time I tried to lift it only a month after purchase. The fabric and handle stitching was simply not robust enough. Best solution would be to have a robust bag, slightly larger, made to order. I did this in Spain in August 2007.